We put it on. Upfront bass, serrated guitars, Cookie Monster vocals: our cat hates it, and stares out the window in disdain. (Or at whatever she usually stares at.) Hillary picked the album up, like most of her collection, when she worked at a record store in college. She liked Nick Cave already and bought this on a whim. She was surprised at how much she liked it. I will be surprised if I can make it to side two. “Try to go back to feeling 13 and angsty,” she says. I was listening to Incubus and blink-182 then: I would’ve hated this record. I can’t say I like it much better 15 years later. I never went through a goth phase. Come back all week for more crate-digging. Are you a Birthday Party fan? 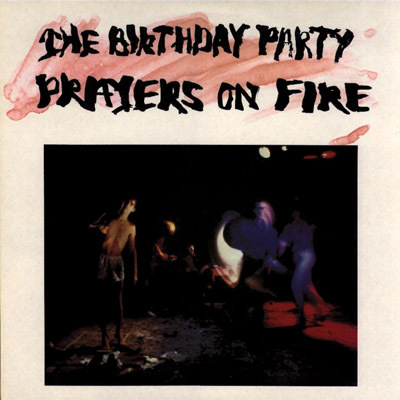 via My wife’s awesome record collection: The Birthday Party, ‘Prayers on Fire’ | OregonLive.com. * Inspired by My Husband’s Stupid Record Collection, Oregonian music critic David Greenwald will be diving into unfamiliar selections from his wife’s vinyl shelves all week. Read the introduction here.